We were in the medium sized city this weekend, meeting up with some friends, doing some shopping, and indulging in Mexican food. As we were about to leave, we stopped into a big grocery store that is part of the mall. Our mission was simple...frozen bagels, grape jelly, and grape soda. Three things that we had been craving for awhile but couldn't track down. As we wandered the aisles, heading from one side of the store to the other, Ian and I noticed a small boy, probably 3 years old, crying in the middle of the main aisle. I knew right away that he was lost and my heart broke for him. Streaming around him were dozens of adults who weren't even giving him a second glance. He was sobbing with tears rolling down his chubby little cheeks and he was slowly walking around, looking up at the faces of the grown up, trying to get help. Ian and I had walked past him, not realizing he was so lost, and we had gotten about 5 aisles away before turning back and going after him. There's always that risk, when helping a lost child, that his parent is right within ear shot and might be suspicious of you talking to or leading their child by hand, so it always makes me nervous. Also, as we approached the little boy, I realized I didn't know how we would communicate with him. The big city has dozens upon dozens of people groups and this little boy was not Western and he was not Arab. We pushed our huge stroller right up to him and Ian asked him where his daddy was. The little boy, between sobs asked "Daddy?" He frantically looked around him and then back up at us. I knelt down next to him and asked him if he was looking for his daddy. "Daddy," he replied, slipping his chubby little hand in mine. We set off down the main aisle, looking up and down the aisles to our right and left with me babbling about his dad and where he could be. I asked him what his name was and I'm not sure if he fully understood my question, but I could tell he recognized the word "Name," and he mumbled an answer. I asked again and he answered. Unfortunately, my knowledge of Eastern names falls short so even though he told it to me twice, my small little mind couldn't wrap around the strange syllables he was saying. I nodded as if I understood, patted his hand, and we all continued on. I looked up from our aisle searching to see a boy walking towards us, probably 7 or 8 years old. He was holding one arm out and beckoning to the small boy. He looked up at me and I smiled, realizing this was probably his brother, and he ran off to join his brother, who led him just 10 feet away to his father, who was emerging from an aisle. The father looked nonchalant and relaxed, he leaned down to listen to his youngest son tell of his tale (I suppose that is what he was doing, since he motioned at Ian and I and then the father gave us a smile and a nod of thanks.) He took his youngest son's hand and began to walk away. He was calm and collected. I realized he was probably on the very aisle where his youngest son had probably wandered from in the first place. Such a simple little moment in time made tears come to my eyes and made me choke up. Blame it on the postpartum hormones or the fact that this was the second lost child I had helped that day, but either way, I was touched. How much like the young boy are we? I would wager to bet that all of us have had moments where we are going through life, happy and content in our little bubble. And then, something catches our eye, distracts us from our purpose, and we wander away from our Father. We forget what we were made for, what we should live for, who our Creator is, and all of a sudden we our on our own, heading for a prize of our own design. Something our earthly flesh desires. We look up one day and we realize the Father is no where near. We've lost site of Him. We are no longer walking with Him. We have left His presence. Panic overcomes us. We grasp at anything and everything that seems spiritual, that seems right. We throw ourselves in, head over heels into empty and worthless things. And then, someone comes along. They ask what we are looking for. "My Father, my Creator, the Sustainer of my life." Led by the hand we see Him again. We relearn how to stay in sight of Him. We vow never to leave His side. He was right where we left Him. Waiting patiently, with open arms, for us to return. In high school I was having a bit of a spiritual battle about the path God had for me. I was confused and didn't know what path before me was the one God wanted me to go down. My friend Jameson told me that if I got lost God would find me. He would tap me on the shoulder and say "Dude, we're going THIS way" and lead me back to my path. Your post reminded me of it. Thank you. 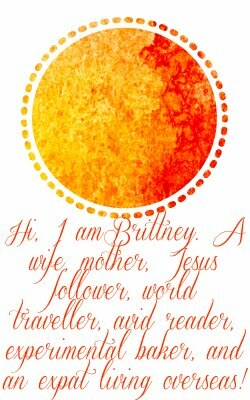 What a beautiful post, Brittney! Thanks for sharing that story. What a sweet story, Britt! Very true parable! Feel free to pop by my blog and say hello!!! Such a good post Brittney! What a picture you drew! No matter how old you are, this is a lesson that you have to keep re-learning. What a blessing to read it the way you told it.